Apple has the largest amount of applications available with just over 600,000 to choose from, and Wedding Party App is one of those. A well thought-out app, that is not only incredibly easy to use, but best of all it is FREE. 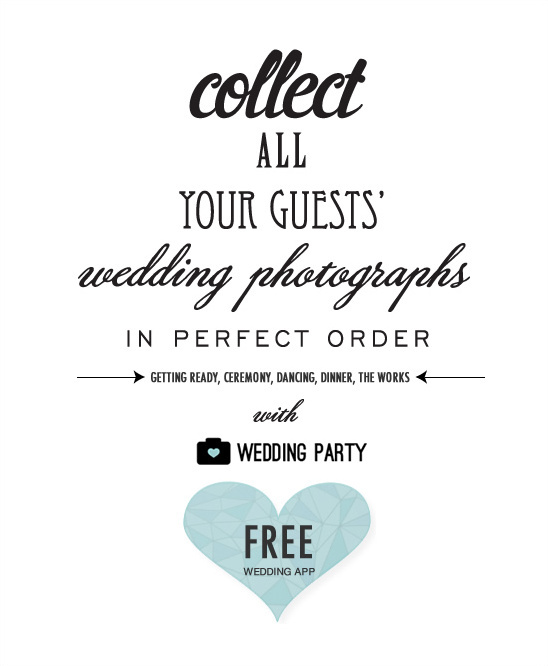 A no charge easy solution to collect all of your guests' behind the scenes photos. Your wonderful photographer will capture all the beautiful highlights, but guests capture the subtle, the fun, the surprising and the unexpected moments. 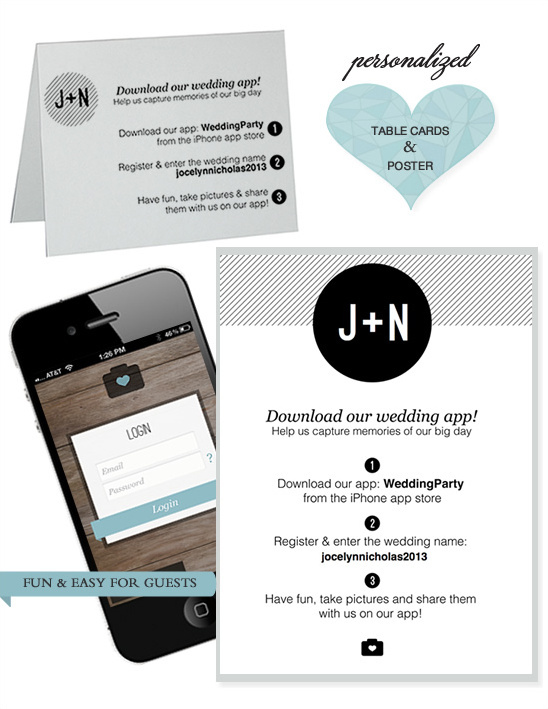 Wedding Party App has quite a few wonderful features that we know you will appreciate. Read on to learn more. Suggest bulk uploads: With the iPhone camera being as good as many point and shoot cameras, guests end up taking a ton of pictures through their phones. Wedding Party App does not require your guests' to take photos within the app, instead they suggest photos based on the time and location that they were taken. 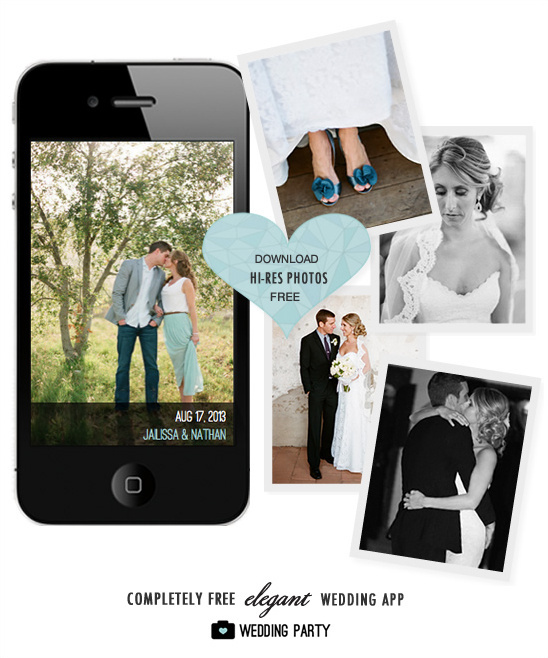 It automatically shows guests the photos they’ve taken at the wedding making it incredibly easy to share. Then couples can upload all of the photos at once with our bulk upload functionality. It’s really simple, any of your guests will be able to figure it out! See your wedding in perfect order from the walk down the aisle to the first dance-While majority of photo sharing apps timestamp your photos with the time of upload, Wedding Party App does something a little more unique. As guests upload photos to the app, Wedding Party App automatically arranges them in your wedding timeline based on when they were captured and NOT when they were uploaded. This way when all the pictures have been uploaded, the couple get a minute by minute timeline of their wedding in the app. From the walk down the aisle to the first dance, all the way to the bouquet toss and send off! Download all your guests' hi-res photos for free-With just one click you can bulk download all the high resolution pictures that were captured at your wedding! Add personal touches-You can customize the app and add a personal touch to it. You welcome the guests with a cover photo of your and your fiance (like above). The app is branded with the name of the couple and we even have customized email invites you can send to the guests along with free personalized place cards and a poster you can download and print( see below)! Perfect for friends and family that could not make it to your destination wedding-Destination weddings are super popular these days but the cost and distance make it nearly impossible for everyone to show. Wedding Party instantly streams all the pictures from your guests to the app and a website as well, so relatives at home can follow every special moment! So, it's a neat way to follow along and even participate!